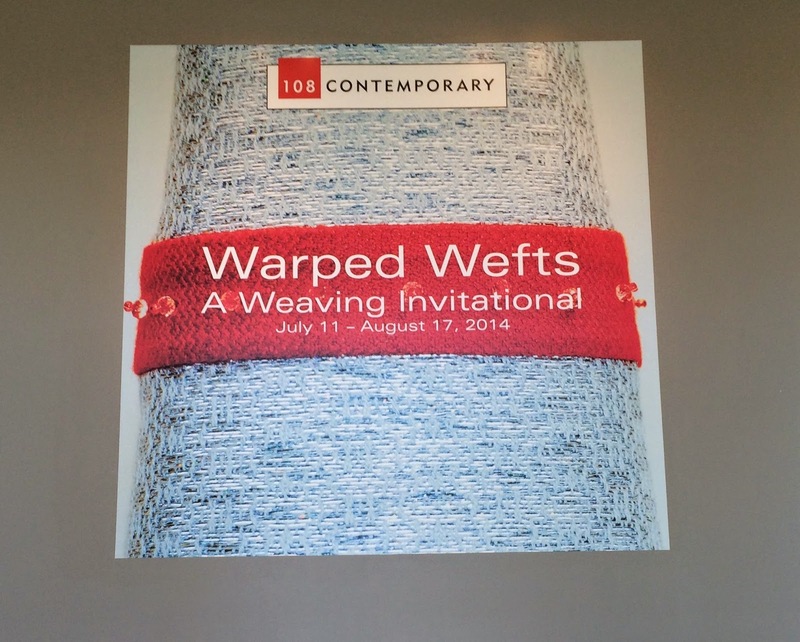 The 108 Contemporary is having a weaving invitational this month and although I missed the opening while on my way to Convergence I did get to see it recently. I spent a few hours last Sunday spinning at the 108. It was toward the end of the show and not very busy while I was there but the people I was able to talk to seemed genuinely interested in the work displayed. 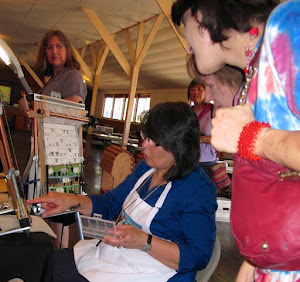 They have had demonstrations in weaving and spinning throughout the show and I was happy to be able to come in and demonstrate. 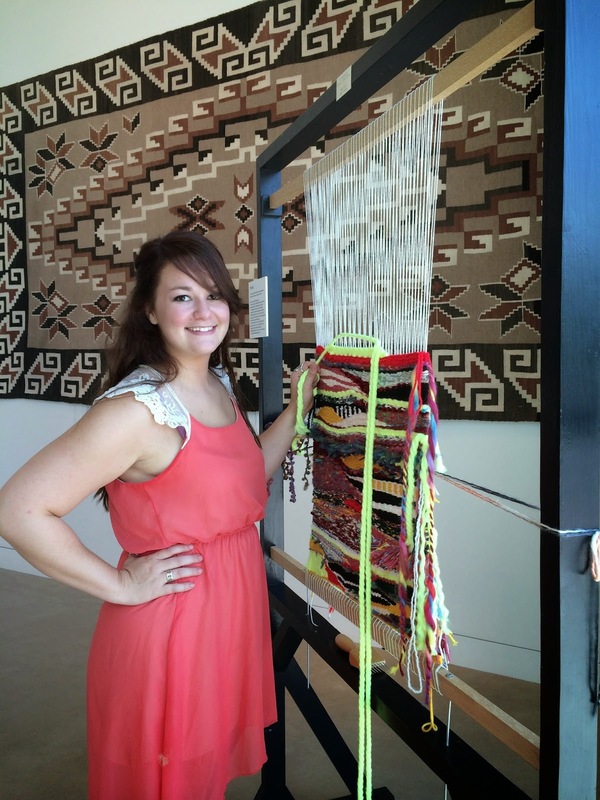 Here is Jen who was working at the gallery that day weaving a very nice shape on the community tapestry that was displayed. 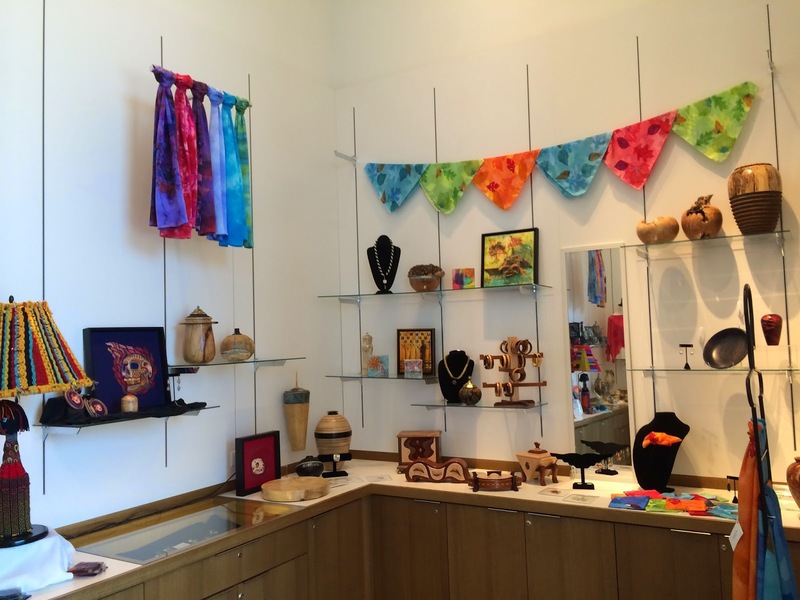 She was also making some weaving kits to distribute and mentioned that they have been very popular and viewers at the gallery were enjoying them. I took a couple of pictures of the space which is just amazing. 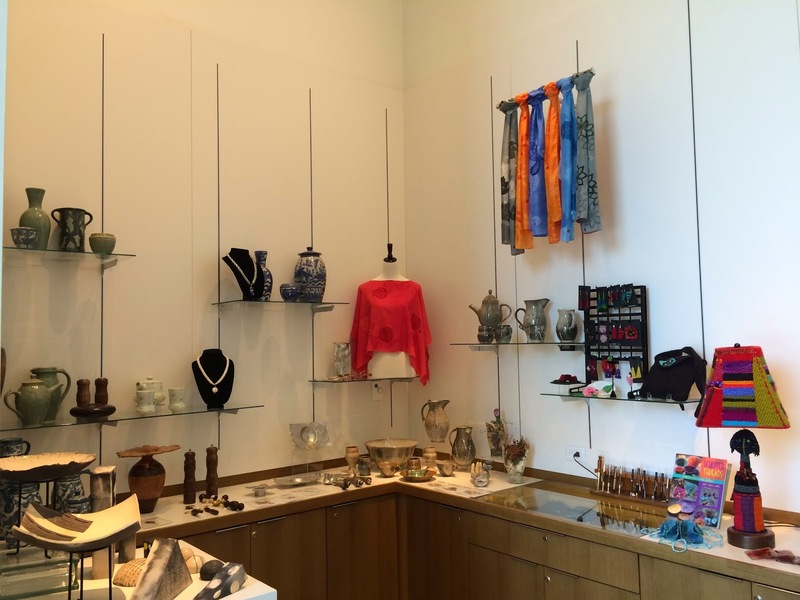 This show included several types of weaving in many forms; wall pieces, garments and three dimensional objects. 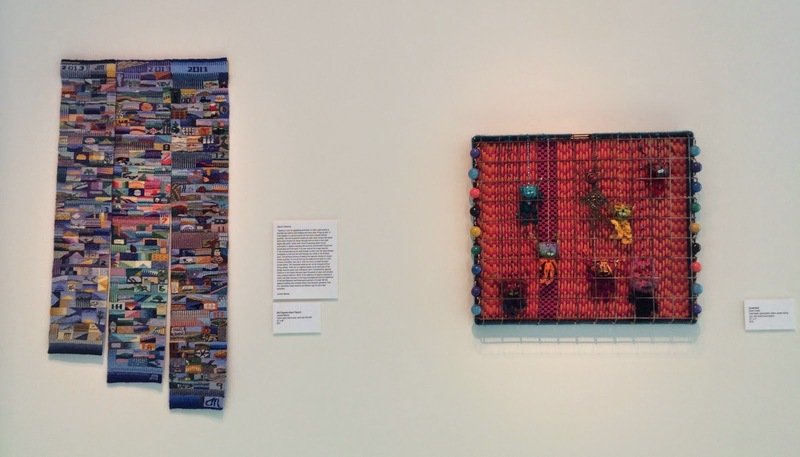 My 2013 Tapestry Diary Triptych was in the show, sharing space with a piece by Sheryl Landis. 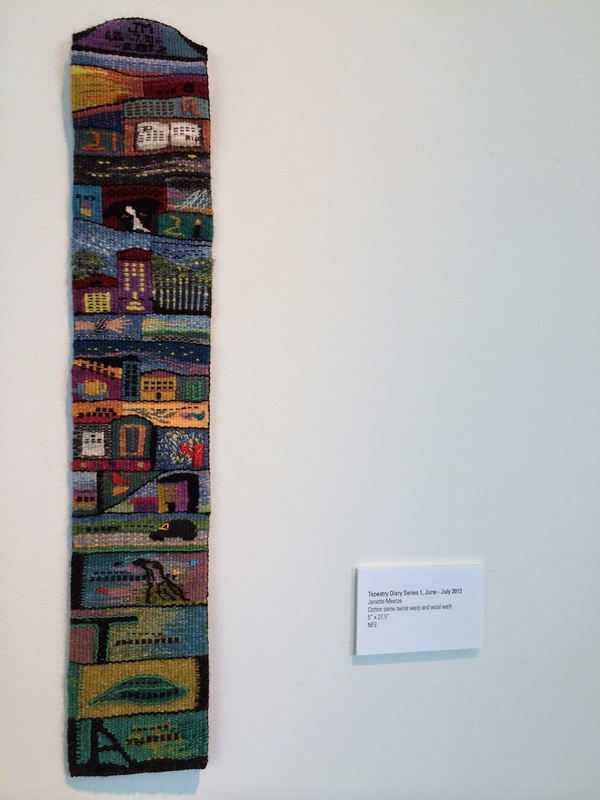 Also my first Tapestry Diary piece from June/July 2012 was displayed. 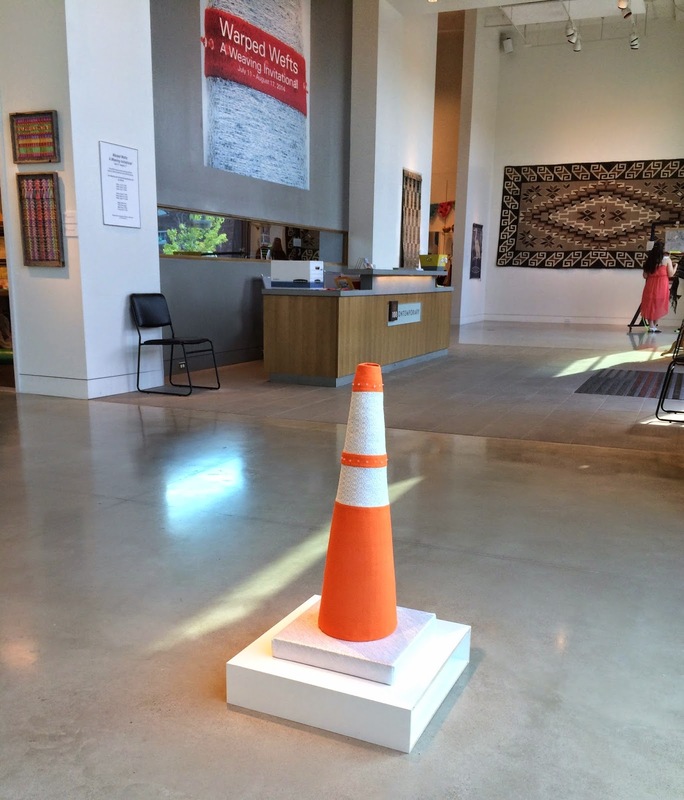 In this picture of the space Lyn Lucas's woven traffic cone is prominent. 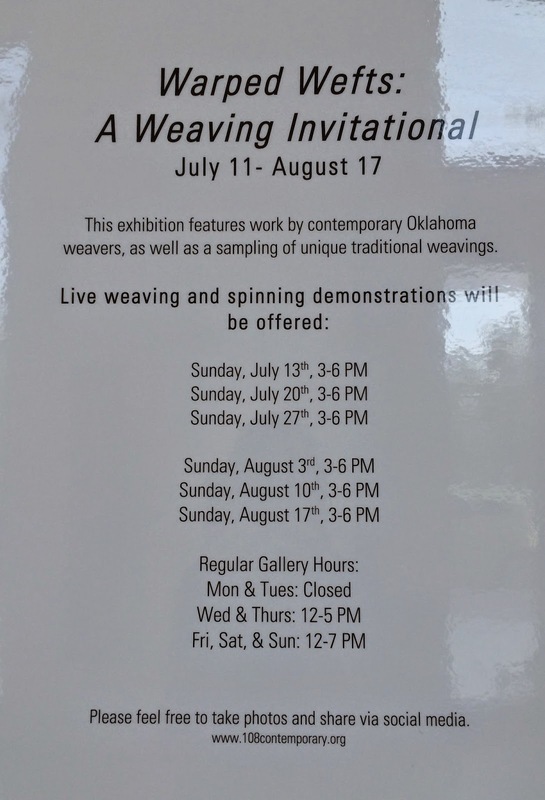 I hope you have had a chance to see the show if you live in the Tulsa area but if not it doesn't close till Sunday so there is still an opportunity. I will share some more pictures after it closes but the best thing is to see it at the gallery! 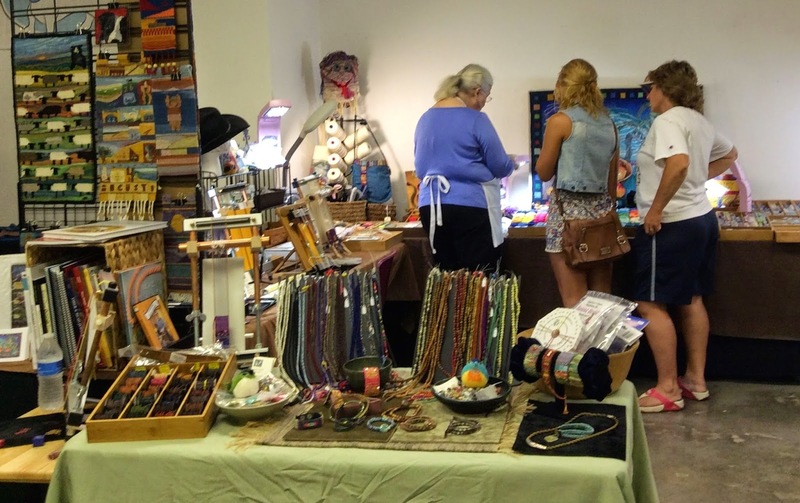 There is also a nice gift shop with a lovely array of hand made things for sale. Since I have been back Mack and I have been trying to catch up on some of the projects left on hold when things got so busy in June/July. 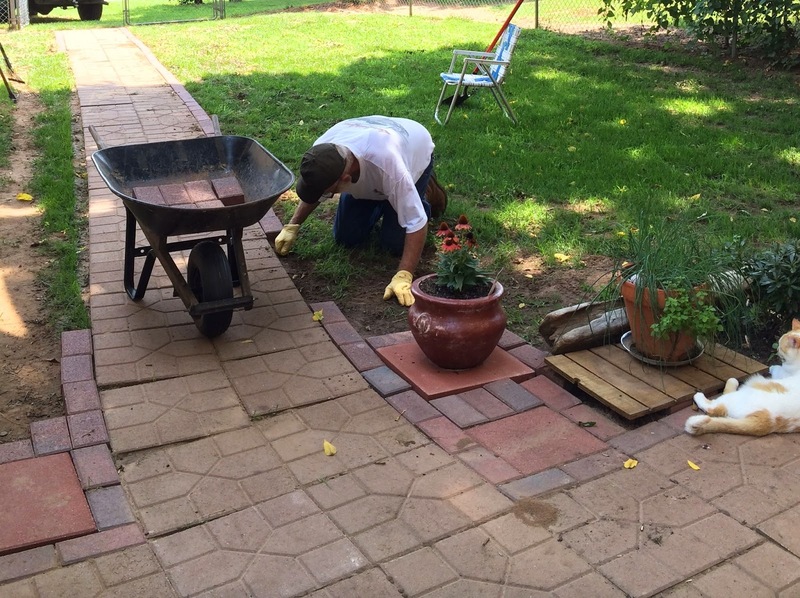 Here is Mack putting some finishing touches on the path to the Fiber Studio. 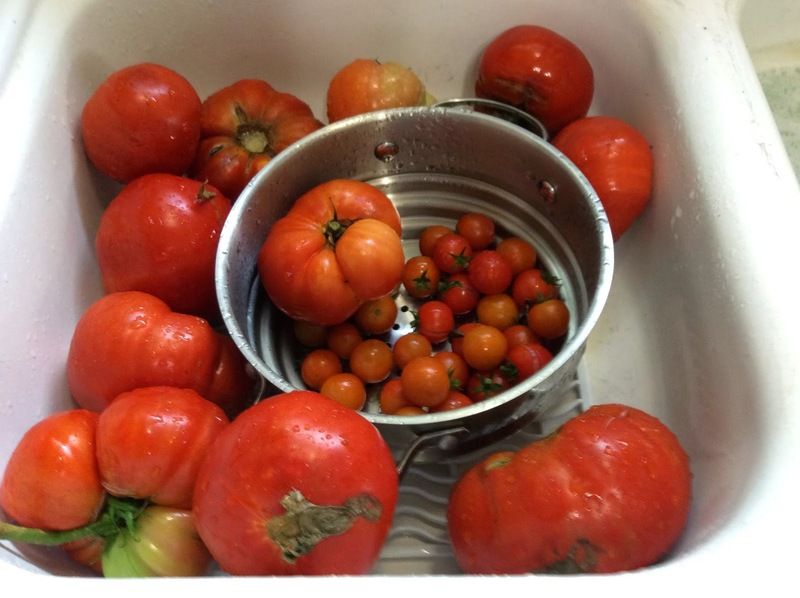 The tomatoes just keep coming and require picking and eating, very tough work. Thank you to Janet for giving me a jar of her excellent tomato jam made with part of my harvest. In addition to getting some details on the studio building taken care, filling orders and making them I have also been making some time to weave. 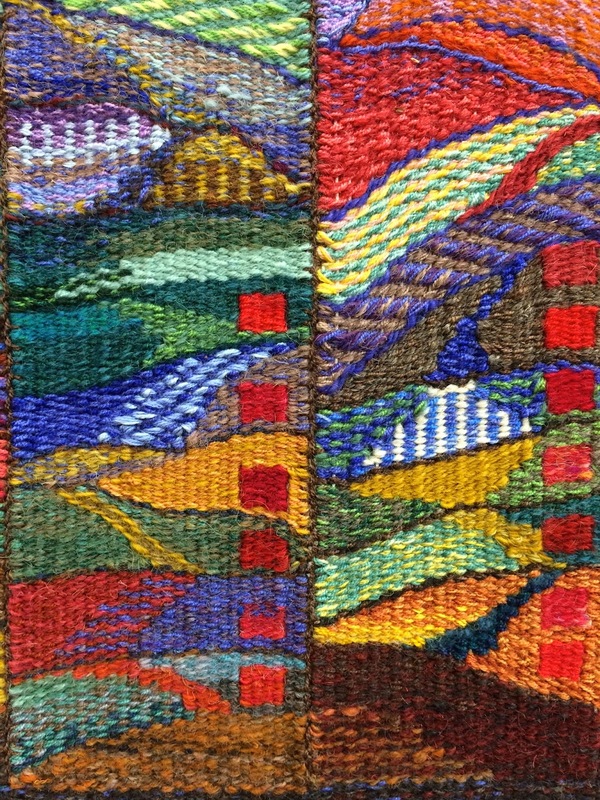 Hands On and the Tapestry Diary for 2014 are making some progress. I have to confess on some days I take out more on the "Hands" than I weave, and so it goes. 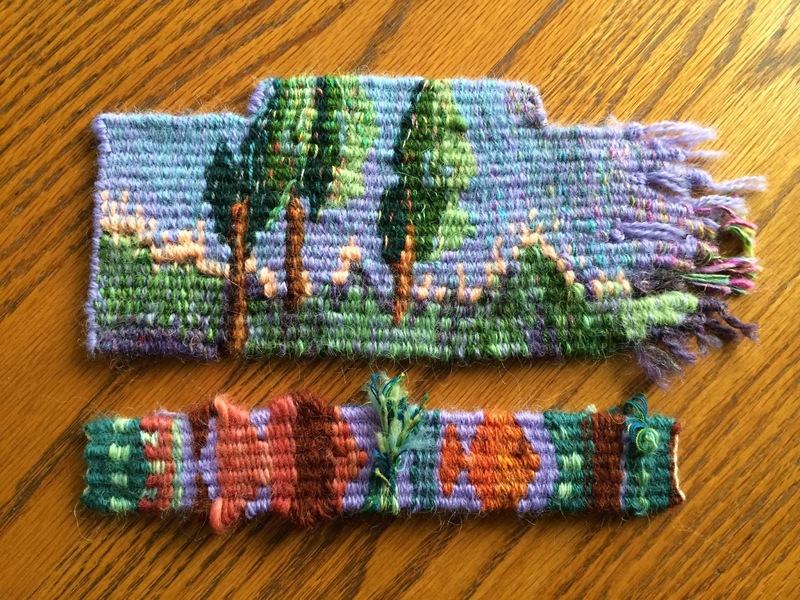 I can't believe that I'm contemplating doing two more of these tapestries with hands! 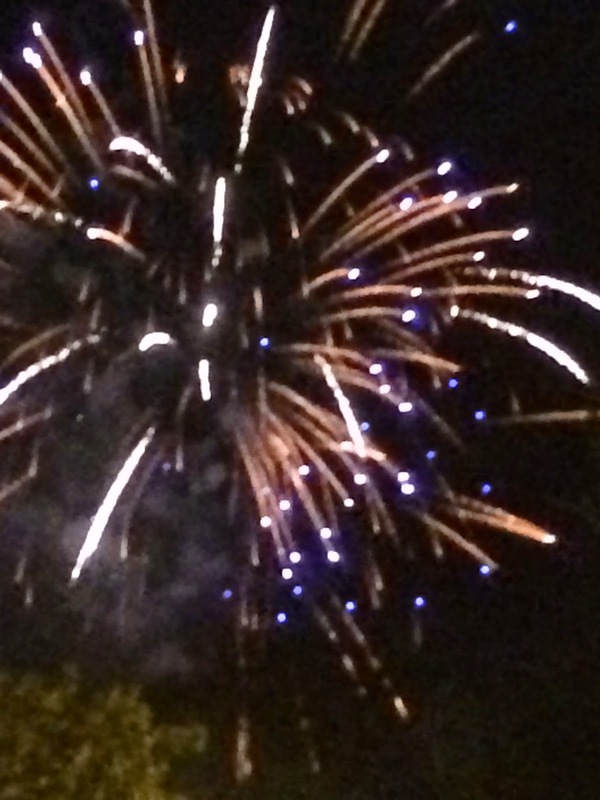 I took dozens of pictures of the fireworks we enjoyed the first night of the American Tapestry Alliance retreat in Rhode Island recently. 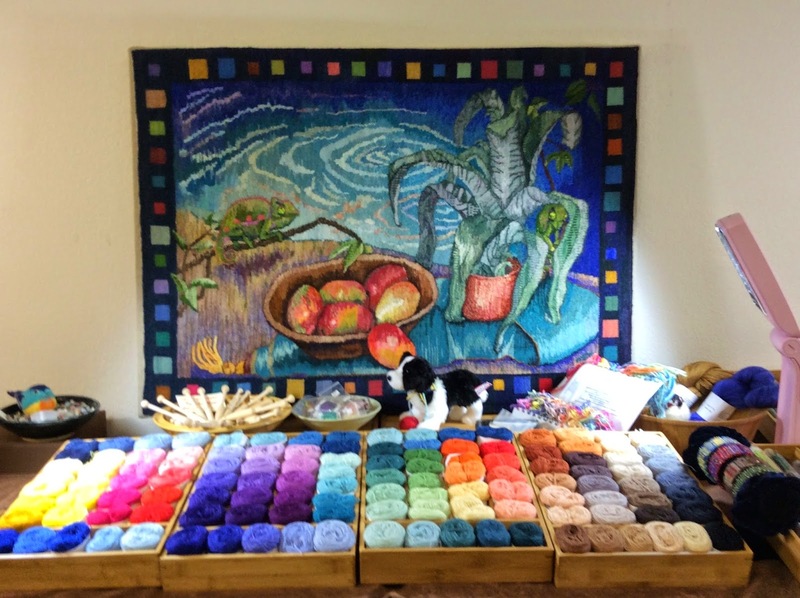 As I was reviewing the pictures from Convergence, the ATA retreat and the Fiber Christmas in July show I did directly after returning home it occurred to me that the last few weeks my life has been like fireworks, fast paced and exciting. Now that the flurry is past the Ahhh of reflection and wonder. I had a wonderful time at Convergence! Even though I did not take any classes I did get to see the Vendor Mall and the exhibits. The most exciting ( and the only) purchase I made at the vendor mall was a new Spencer power treadle for my Mirrix Looms. Here is a picture I took this morning in the Studio. I am getting very attached to this new tool. 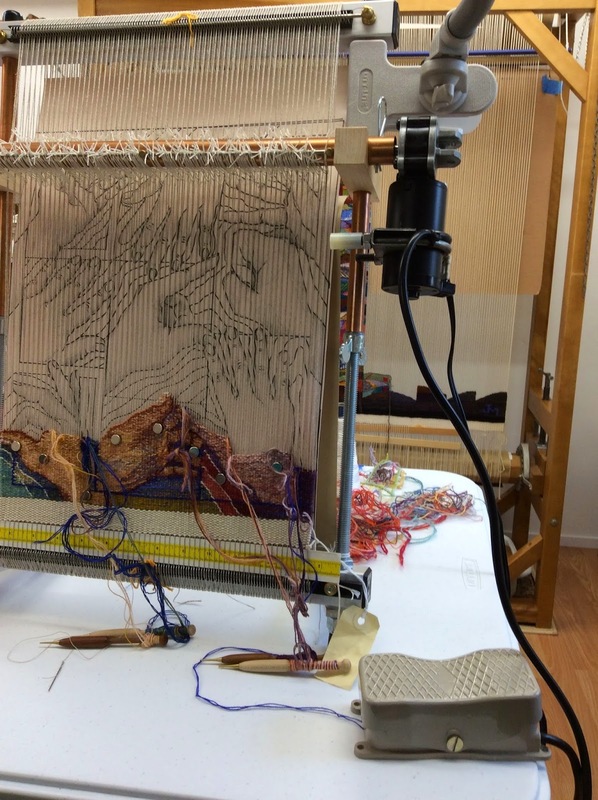 Not only does it work fast and efficiently with little effort to open the sheds but it is so much easier to carry along to shows and to attach and detach from the loom. It took me less than a weekend to be quite spoiled by it and very comfortable with its operation. It was also so much fun to meet Claudia and Elena there. 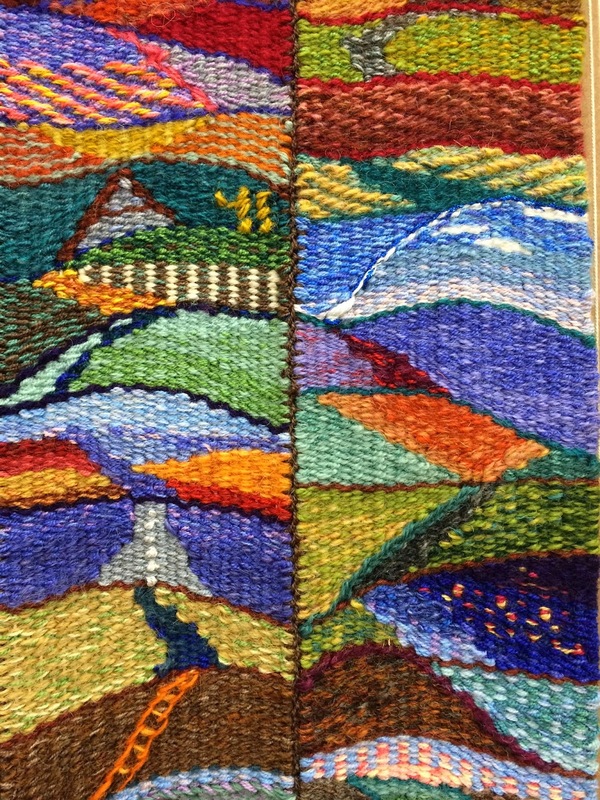 One of the most exciting things about the whole experience was meeting so many tapestry weavers previously only known through Facebook face to face. I even managed to make a few brand new friends while in Rhode Island. 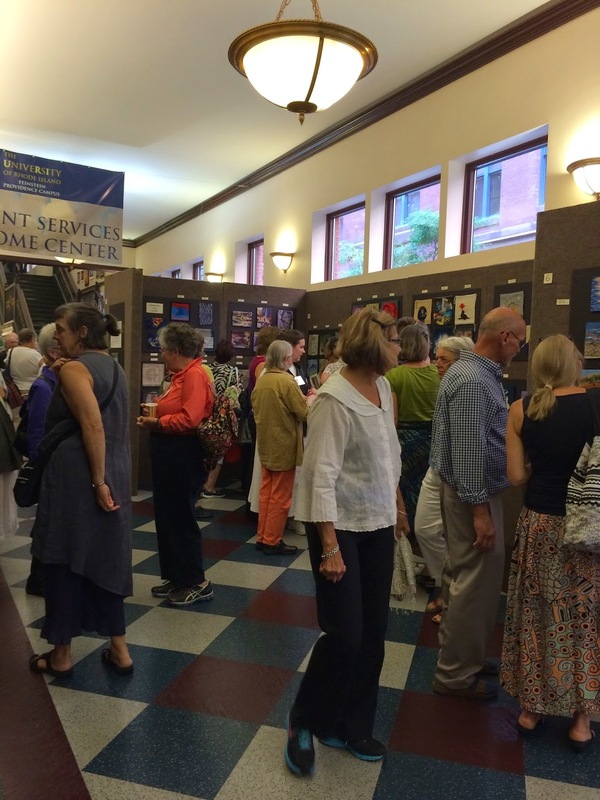 On Thursday night the Untitled Unjuried show opening was inspiring. 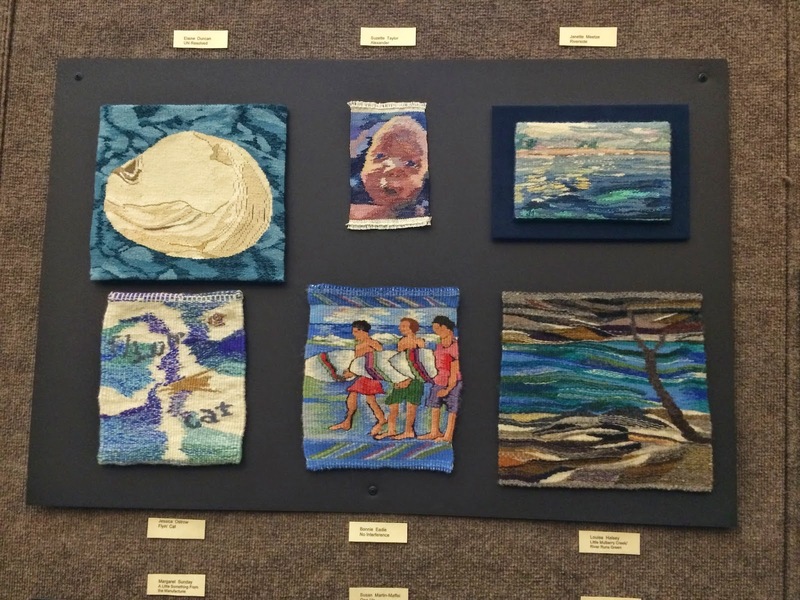 The gallery director said that about 500 people attended and with so many small tapestries from all over the world it was an exciting event. Janet Austin headed the show committee and her hard work was evident everywhere. It was a great event! 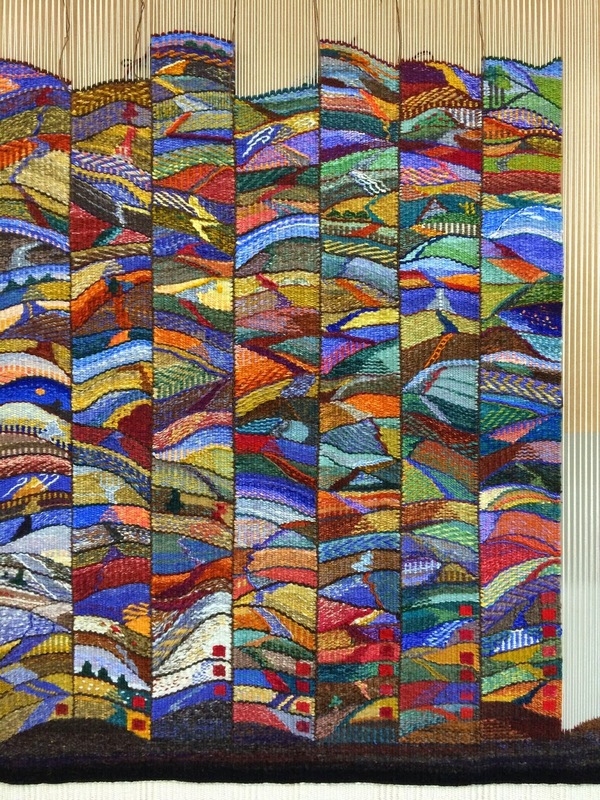 Here is the panel with my Riverside tapestry on the upper right. 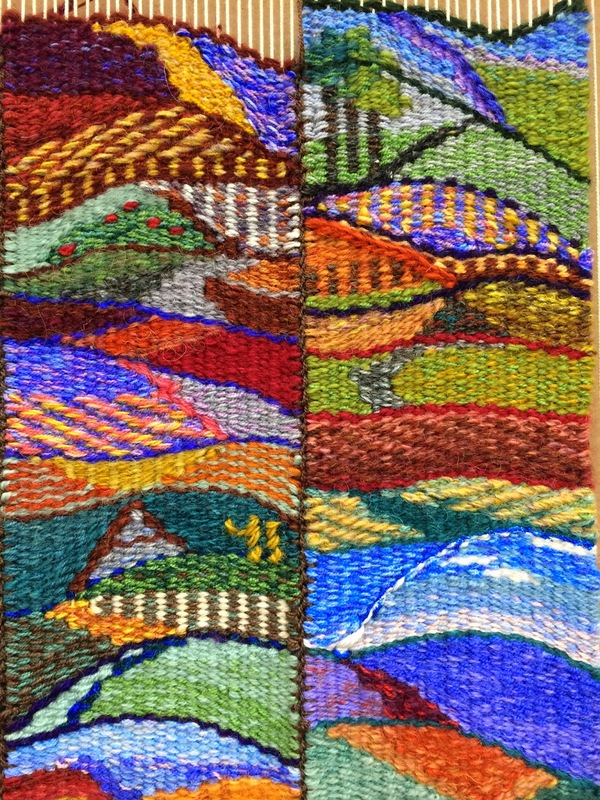 If you want to find out more about the show including pictures of all the tapestries check out Janet's blog. 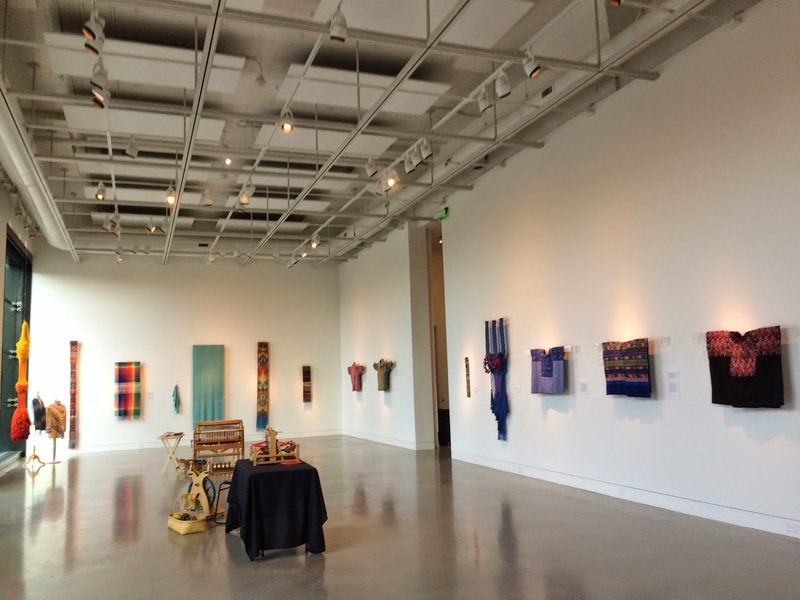 On Friday I was able to make a day trip to the Fuller Museum where the Small Expressions HGA exhibit was installed as well as another wonderful fiber show. 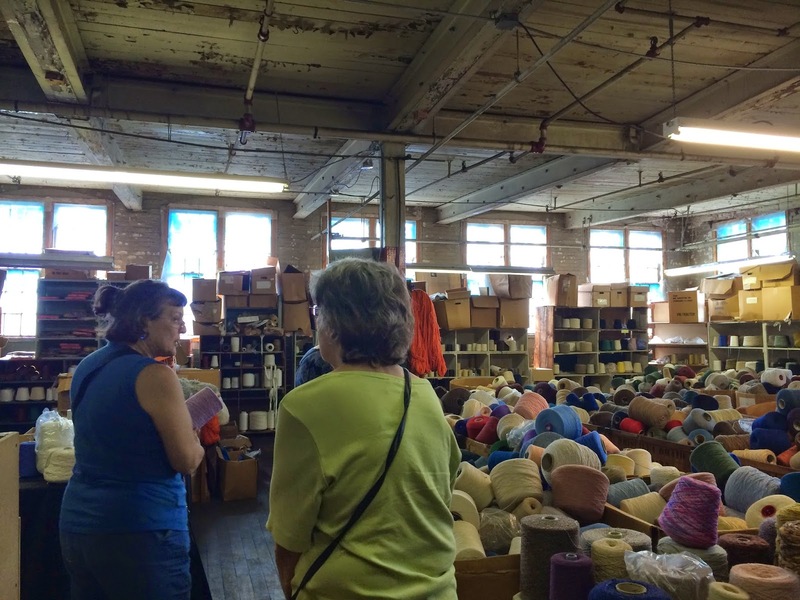 Later that day we visited Peter Patchis yarn warehouse which was a fun side trip and I was able to collect a few samples that ended up in the sample I wove at the workshop later in the week. 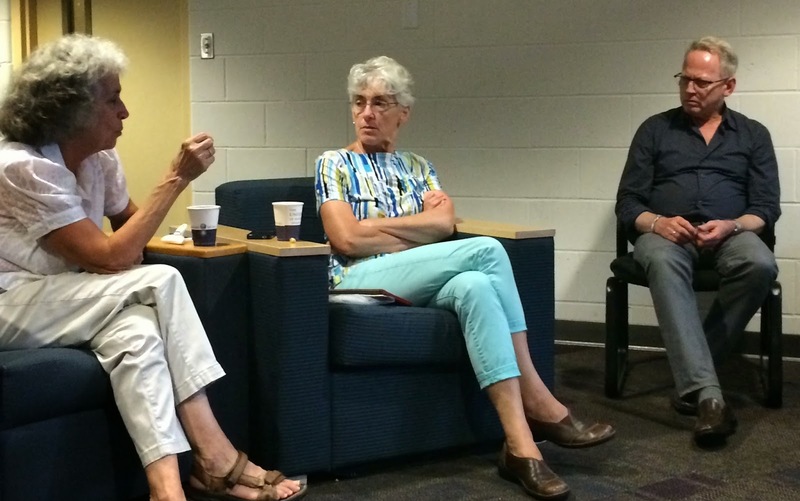 The first evening of the ATA tapestry retreat was marked by an exciting bus ride that included a glimpse of the Rhode Island coastline, a dinner and concluded with the fireworks I mentioned earlier. They were actually part of a hot air ballon festival on campus that weekend but considering the timing it felt like they were especially for us. Once the workshop started with talks by both of the instructors Susan Martin Maffei ( far left ) and Marcel Marois (far right) things started to get busy! In the middle is Mary Lane, coordinator of the event for ATA. My workshop was with Susan. 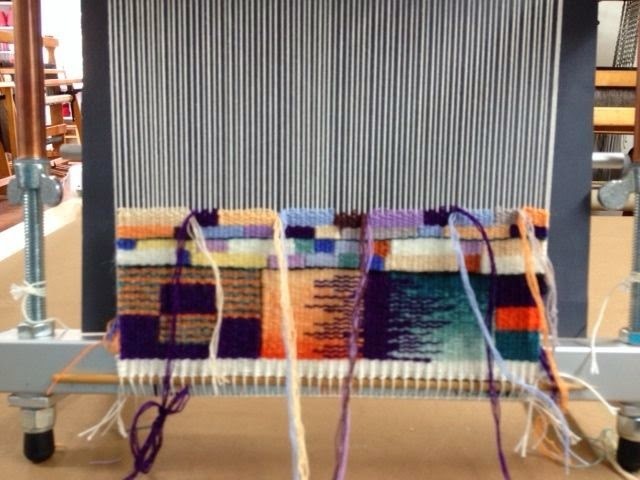 Here are the small samples I wove during the workshop. Susan led us through four selvedge weaving ( no warp ends) and adding supplemental warps to create shaped tapestries and then through many interesting finishing techniques like embellishments with feathers and crochet; even how to move the warp threads to create shaped edges. Fascinating, fun and a great workshop! My only regret was that I couldn't be in two places at once and take Marcel's class also. Everyone who was in it seemed excited by all the design inspiration they received there. After all the pleasant exhaustion of the ATA retreat and workshop I have to admit the trip home was not that pleasant. Starting with catching a limo ride at 3:30 am on Wednesday morning to arrive at the Providence Airport for a flight at 6am. Then sitting on said flight because of a computer glitch for an extra half hour which resulted in missing my connecting flight from Chicago to Tulsa. After a great deal of walking and confusion at the Chicago Ohare airport I discovered about 9 am that there would not be an available fight to Tulsa until 7pm. Ah, the joys of a 10 hour layover at the Ohare airport! Instead of arriving home at 10 am on Wednesday it was more like 10 pm. 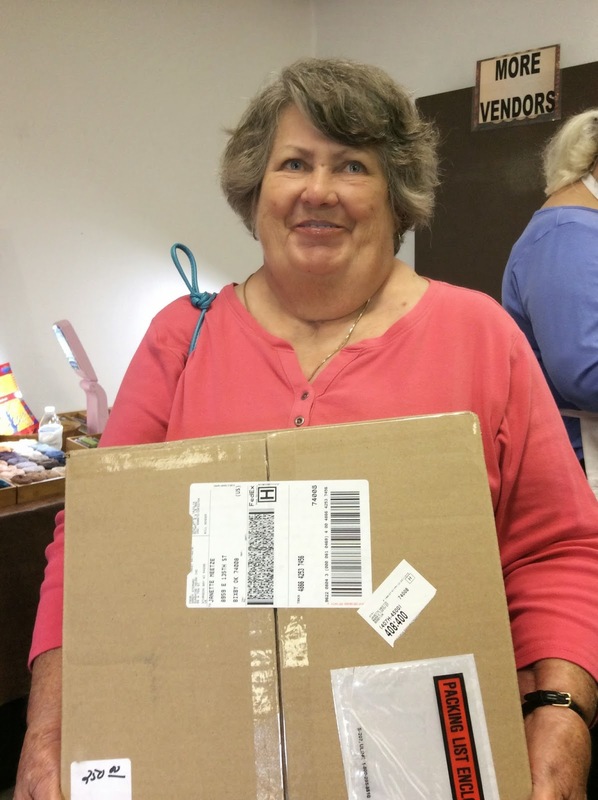 Never mind, I had until Thursday at 7pm to pack and deliver my things for the Fiber Christmas in July show. This show just keeps getting better every year and despite my less than energetic start I had a great time. Lynn and Janet were there to help which made the whole thing possible. They definitely have the best food of any of the shows I do and we had a nice roomy booth space where all the looms were nicely displayed. 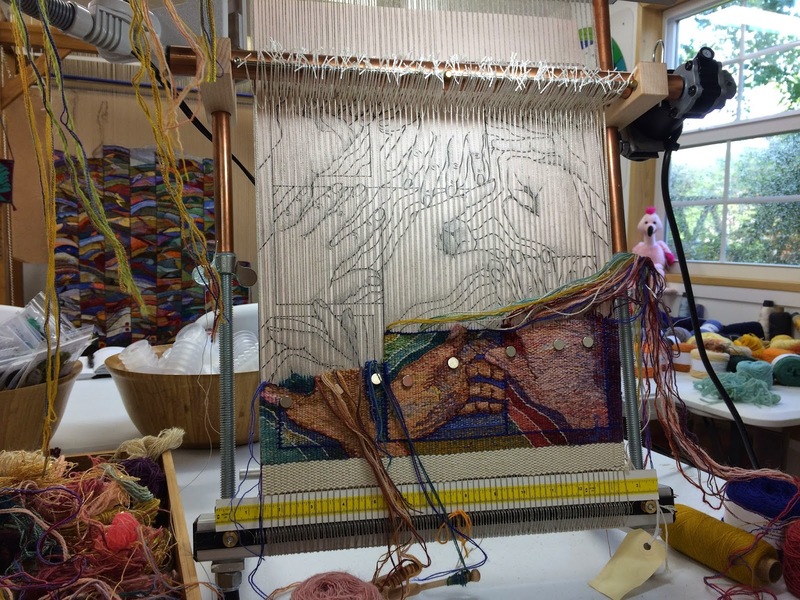 I had a special spot to demonstrate tapestry weaving and play with my new power treadle from Mirrix. It didn't take any time at all for me to become spoiled by the ease of opening those sheds. 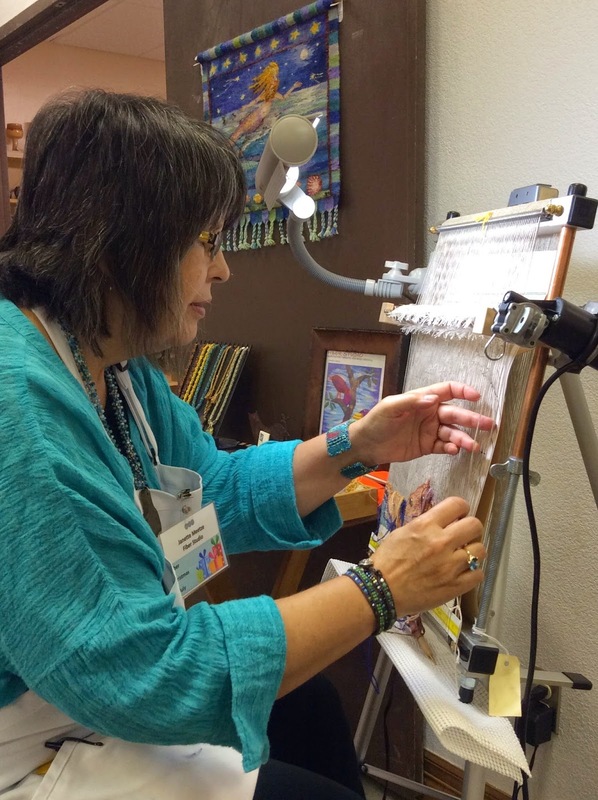 Channel six came by to talk with me and film me weaving as well as others at the show. If I find out when it will air in time I will try to post it here on the blog. Here is a picture Of Emmelita from the show. I can't say she is a new Mirrix owner because I know she already has at least one at home but she is the owner of a new 12 inch Little Guy. I celebrated the fact that FC is a local show by bringing the Mango Hunters to display. It took me a few days to get things in order after the show, unpack and put the shop part of the studio back together. Then there was the day long laundry fest and I really wanted to weave the days I was away on the TD so I had some weaving to do. Here is a picture with July 2014 complete. 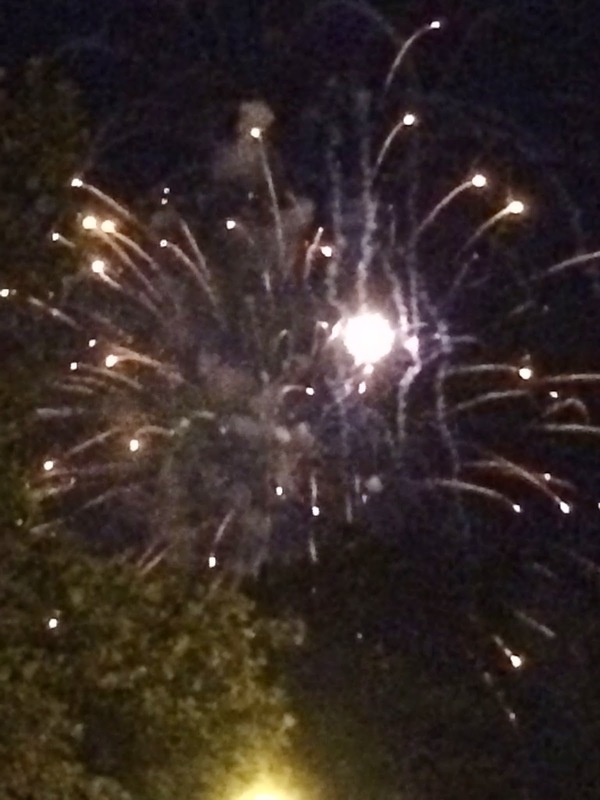 to this one which includes the fireworks in Rhode Island. At the top and end of the month it looks like Spring. It really felt like Spring that week with temps in the 70's and plentiful rain. Not your typical July/August in Oklahoma! I now have August underway and am doing a little work on the top edge so I will have more progress photos soon. 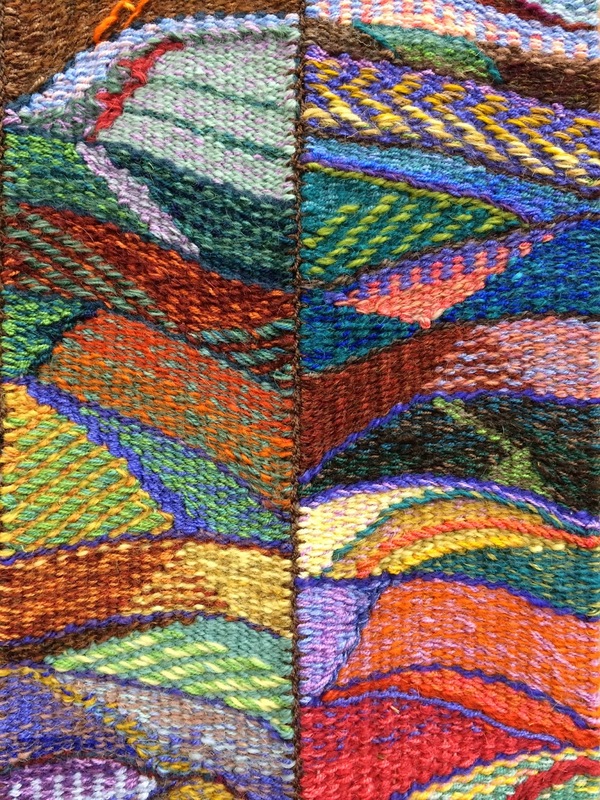 Let me finish with this lovely beginning of a color study in Ymmyarns woven by Cathie Beckman at a color class with Tommye Scanlin recently. The color palette and lovely gradations of Ymmyarns make them ideal for studies like this. Thanks Cathie for sharing! I have a few other photos that friends have sent me but am having some trouble loading them so I will try to work that out for next time. For now the fireworks are over and I am entering the nearly cooked popcorn days, small bursts of excitement followed by a little rest in between. I am ready for the popcorn days and ready to do some weaving!